We believe Prayer is key to our lives as Christians. It can take many different forms: alone or with others, silently or out-loud, using our own words or the words of well-known prayers. Sometimes it can be helpful to light a candle to provide a focus for our prayers as we meet with God. Should you need prayer for anything in particular, you can request a prayer from the clergy . St Mary with St Alban is open during the week for prayer. St Peter and St Paul on Thursdays at 9am. 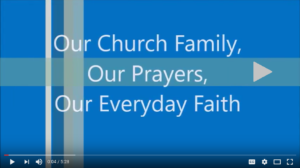 Below is an excerpt from a video called “Our Everyday Faith” which was played on a loop in church during the “Three Days of Prayer” leading up to Pentecost. It contains real prayers prayed by real people; it blessed us to make it and we hope you find inspiration in the prayers offered.